CIA Director David Petraeus has submitted his resignation to President Obama, citing an extramarital affair. In a statement sent to the CIA workforce today, Petraeus said he went to the White House Thursday to ask the president to accept his resignation. The president accepted his resignation today. "After being married for over 37 years, I showed extremely poor judgment by engaging in an extramarital affair," Petraeus said in the letter to the CIA workforce. "Such behavior is unacceptable, both as a husband and as the leader of an organization such as ours." CBS News has learned that for the last few months the FBI has been investigating the communications of Petraeus. Law enforcement sources tell CBS News' Bob Orr that there was concern about emails the CIA director was sending and receiving involving a female journalist. Additional sources tell CBS News the communications involve his biographer, Paula Broadwell. A Justice Department official tells CBS News that Broadwell's name surfaced while the FBI was undertaking a separate investigation into whether Petraeus' computer might have been compromised. In explaining why the FBI would be investigating the communications of the CIA director, CBS News' John Miller reported that what is more likely is that that the communications of someone else-- possibly in a foreign country that are now touching the C.I.A. director's communications-- would rise to their attention. What happens here is they're looking at these messages that seem to be cryptic in nature and raises the question, "Who is this person?" "What are these communications about?" "Why are they cryptic?" As for whether any national secrets were revealed from this incident, Miller said according to his sources that there were no classified information, no security violations and certainly nothing that would constitute a violation of law or anything criminal. Broadwell, a Harvard University research associate and PhD candidate at King's College London, was granted extensive access to Petraeus to write his biography, "All in: The education of General David Petraeus." She was embedded in Afghanistan with Petraeus July 2010 through July 2011, while he led the International Security Assistance Force there. CBS News has reached out to Broadwell on Friday for a comment, but she has not responded. In a March 2012 interview with CBS News' Jeff Glor, Broadwell said of Petraeus, "I got to see a more personal side - he's confident - but he is also very compassionate about the loss of troops and the sacrifices we're making in Afghanistan on the front lines." "He, at the end of the day, is a human and is challenged by the burdens of command and has mastered wearing the mask of command, if you will," she added. "Because he knows that the commander of 150,000 forces to whom our nation and many other nations were looking for leadership and decisive action needed to show resolve and commitment." In a feature written by Broadwell in the latest issue of Newsweek called "Petraeus's Rules for Living," rule No. 5 was, "We all will make mistakes. The key is to recognize them and admit them, to learn from them, and to take off the rearview mirrors -- drive on and avoid making them again." Petraeus took over as director of the CIA in September 2011. An extramarital affair could have serious implications in the intelligence agency, given that it could potentially lead to security leaks. A White House official told CBS News' Nancy Cordes that the White House did not know before the election that Petraeus would resign and that the news comes as a surprise to everyone. In a statement, Mr. Obama said he is "completely confident that the CIA will continue to thrive and carry out its essential mission," adding that he has the "utmost confidence" in Acting Director Michael Morell and the CIA workforce. The White House has had high praise for Morell, who may be in line to replace Petraeus. The president said his "thoughts and prayers" are with Petraeus and his wife Holly Petraeus, and he praised Petraeus for his long history of serving the nation. "By any measure, he was one of the outstanding General officers of his generation, helping our military adapt to new challenges, and leading our men and women in uniform through a remarkable period of service in Iraq and Afghanistan, where he helped our nation put those wars on a path to a responsible end," Mr. Obama said. "As Director of the Central Intelligence Agency, he has continued to serve with characteristic intellectual rigor, dedication, and patriotism. 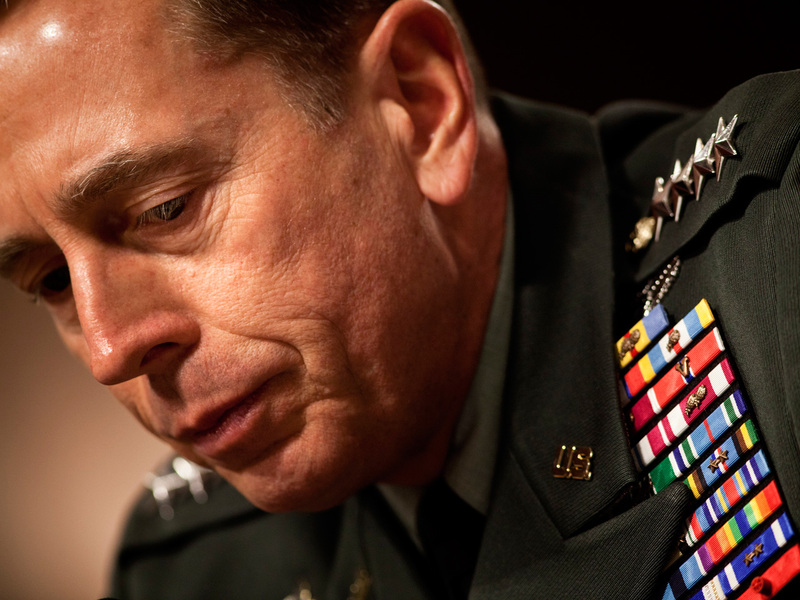 By any measure, through his lifetime of service David Petraeus has made our country safer and stronger." Director of National Intelligence James Clapper similarly said in a statement that the CIA director's decision "represents the loss of one of our nation's most respected public servants." "From his long, illustrious Army career to his leadership at the helm of CIA, Dave has redefined what it means to serve and sacrifice for one's country," he said. Petraeus was scheduled to testify next week at a closed hearing of the Senate Intelligence Committee on the terrorist attack on the U.S. consulate in Benghazi, Libya, as well as intelligence and security in the region. The Senate Intelligence Committee says Morrell will testify in Patraeus' place. Before heading the CIA, the 60-year-old Petraeus served for more than 37 years in the U.S. Army, most recently as commander of the International Security Assistance Force and as the commander of U.S. forces in Afghanistan. Petraeus' high profile career has made him one of the most well known generals of his generation, winning him widespread praise and spurring speculation that he would run for political office. In his opening statement during his confirmation hearings for the position of CIA director, Petraeus praised his wife, who now serves as assistant director of the new Consumer Financial Protection Bureau. "Holly was recently described as being bright, nice, small, and a pit bull - someone you want in your corner," he said. "I have been blessed to have had her in my corner for some 37 years and 23 moves." He also discussed "appropriate behavior" during his confirmation hearing. "The leader of any organization is responsible for establishing the necessary climate and processes for ensuring appropriate performance and behavior by the organizations' members," Petraeus said. "I am confident that the CIA has a culture of high standards and the necessary regulatory processes for managing wrongdoing or misconduct."